The concept of ground is a particularly dangerous area of confusion for electronics because the term is overloaded to apply to several related but different situations. One technique to help demystify the concept is just to replace the word ground with reference or relative to. In Voltage and Current we said that all voltages are relative between two points. In Electrons at Rest we explained that the electric potential function is just another way of expressing how the electric field would push on a test charge. In this context, the absolute value of the electric potential function doesn't matter: only the direction and slope of how it changes -- specifically its gradient, to use the multivariable calculus terminology. The gradient of a scalar function $f(x,y,z)$ is not affected by adding some constant offset to that scalar function $f(x,y,z)+C$. For the purpose of circuit analysis, it's often incredibly convenient to define some arbitrary point, for example B, to be our universal zero-voltage reference, or to be our ground point: now we can say $V_A$ only, and the B is silently implied. Note that in the Voltage and Current we said that voltage is always across two points. However, now that we've chosen a ground point, we're formulating sentences that describe the voltage at a single point. This is a confusing difference in terminology, but it is convenient and short and commonly used. In fact, it is still equivalent: when we say "the voltage at point A," we always mean "the voltage at point A with respect to ground," even if we don't say it aloud. 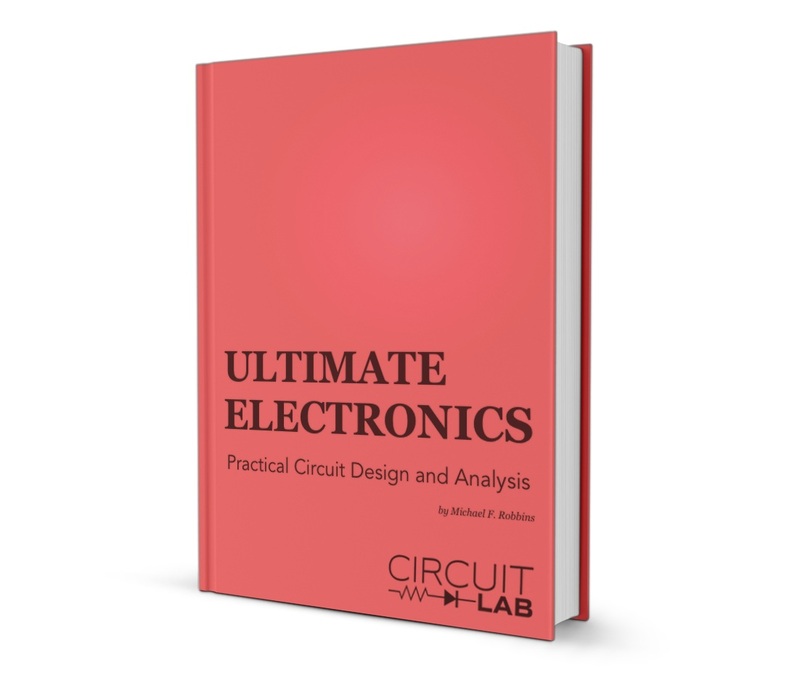 The choice of ground point for circuit analysis is arbitrary, but there are some conventions in how to choose it for convenience in solving your circuit and for easiest communication with other engineers. This will come up again in Labeling Voltages, Currents, and Nodes where we'll see that defining a ground node can help simplify our circuit equations as we solve them. This is not that different from simply considering ground to be our de-facto zero voltage reference. It's just a matter of a defined reference point. The concept of ground may be especially tainted because early communications systems literally used the earth to carry return current. But this was a bad idea -- don't do it! Ground does not remove the rule of conservation of charge from any circuit. Ground is probably not as special as you think. Just think of it as your chosen $V=0$ reference. We may see different grounds, sometimes with different names and symbols, like signal ground, chassis ground, and earth ground. These can coexist even within the same system. There can also be analog ground, digital ground, and RF ground, for example. Which one is "right"? Which one is the "true ground"? Perhaps they all are. They are often explicitly connected together at some point. In practice, we care not just about what our 0-voltage reference is, but the actual physical path of current (intentional and unintentional), because that path affects everything else that's connected to it. That's because our simplified Lumped Element Model makes the assumption that a node is a node, even ground, and any wires connecting different grounds together have zero delay and have zero resistance, inductance, and capacitance. This assumption may be "good enough" when we're working at low frequencies. However, in the real world, wires do have nonzero resistance, inductance, capacitance, and it does take some nonzero time for a signal to get from point A to point B thanks to the speed of light. Because of these factors, we do sometimes have to concern ourselves with the specific role of each ground and understand that these grounds may not be entirely in sync at all times. Another case of multiple grounds is in high-speed interconnects, like PCIe connectors with computers, etc. These connectors have many many grounds -- often one ground wire per signal wire! If they're all grounds, why not just have one? It's because any signals couple via electric and magnetic fields to any nearby conductors. And, if the we make sure the nearest conductor is a ground, that's better than it coupling to (and distorting) another signal conductor. For more, see later chapters on Noise Versus Interference and Designing to Minimize Interference. Multiple grounds, or the presence of ground loops, are evidence of violating the Lumped Element Model. We can't assume that the entire ground node is at a single potential. We can't assume that it's all in one place physically, so information takes time to propogate. Interconnecting physical grounds create [b]loopsb] in our circuit that may have time-varying magnetic flux, which create non-conservative electric fields, which induce voltages that break Kirchhoff's Voltage Law. However, the simplifying assumption of ground is still usually good enough, but keep your eye out for times when it's not. In these cases, remember that it's just an arbitrary reference point, so choose one and then model the various non-idealities as part of your lumped element model as needed. First, they're concerned about outdoor lightning strikes, and want to make sure that any lightning that does strike the antenna discharges into the earth, rather than into your equipment. Second, they're concerned about a ground plane, which some types of antennas require and can be provided by the conductivity of the earth itself. (Or, for example, the steel body of a car.) But not all antennas need a ground plane. These are separate concepts from the ground as voltage reference described above, so the choice of phrases antenna grounding and ground plane is an unfortunate one and an easy source of confusion. Just because we draw a little symbol on our schematic call something "ground" doesn't mean it is a nice quiet 0-volt place to be! Ground loops are a common problem when ground at point #1 is not the same as ground at point #2. These cause significant problems is system interconnects, audio systems, and more. For example, this can just be two different outlets in the same building have slightly different grounds whether we like it or not. Distance Matters: because the area of the loop itself is a way for induced voltages to cause problems. Distance also is correlated with higher resistance, inductance, and capacitance of the wire between two points, as well as the inevitable speed-of-light propogation delay. Current Matters: because current flowing into the ground with finite resistance causes a voltage drop that makes two points have different voltages. Frequency Matters: because higher frequency signals have shorter wavelengths. In the next section, Resistance and Ohm's Law, we'll talk about resistors and why they follow a linear current-voltage relationship we call Ohm's Law.